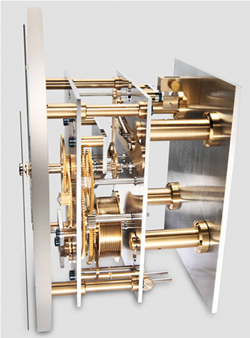 Precision Month Running pendulum regulator – a Kieninger Masterpiece limited to 100 pieces. The design displays the superb craftsmanship an innovative design. The clock consists of a UV glued glass case with a carbon fiber back panel which is held by 4 metal brackets and a key drawer integrated in the base. The technical appearance is completed with a matt chrome finish of all metal components and applied polished brass bars on the dial. Four hidden adjustment screws allow an optimum positioning of the cabinet. The modern classic appearance is completed with a matt chrome finish of all metal components and applied polished brass bars on the dial. The High quality Temperature Compensating pendulum consists of a carbon fiber shaft and a unique bob. Carbon fiber is barely effected by temperature changes so time-keeping is excellent - an above average precision of +/- 5 seconds per month can be attained. Dead beat escapement (Graham 12 ½ teeth) with Kieniramic® anchor pallets. One month running time – an above average precision of +/- 5 seconds per month can be reached. Power reserve keeps the clock running during rewinding. - Winding limiters prevent accidental over winding. - Principal shafts are carried on eight ball bearings and five rubies; this dramatically reduces frictions enabling a small drive weight of 3,1 kg. Fine beat adjustment to provide an even tick. -Precision carbon stick pendulum with temperature compensation and fine adjustment. Kieninger 2580-96-01 - In stock and on display at Oakside. The Kieninger 2580-96-01 in a room setting. ZS 001 Precision Regulator Movement - month running. Kieninger ZS 001 calibre precision cable movement with central swept second hand, ground plates with diamond cut edges and matt chrome finish. Click here to view the Kieninger 2580-96-01 Options and Prices page.